Let me start by disclaiming “spoiler free” – I assume you have seen a preview or read at least enough to know the most basic premise of the film. If you truly have no idea what it’s about, well, I make references to content used in the trailers. But seriously, if this does describe you, why are you even click to get this far? I had a chance to see an early screener of the movie tonight, and felt like doing a little writing about it. In all candor, I’m more negative than positive on it personally, but I think there are a lot of reasons to go see it in theaters (if you are going to see it at all). Gravity might well define the “must see in theater” experience far more than any action movie ever would. Beautiful, amazing, breathtakingly phenomenal cinematography. I honestly feel closer to having an idea of what being in space might be like as a result of the way this was shot. Solid acting. I felt the characters were genuine, and Clooney/Bullock fit their roles quite well – in fact I’m surprised at any negativity toward the acting on IMDB message boards or other spots. Suspenseful. Cuaron did a great job keeping the audience on the edge of their seat, and had a solid balance between slowly built, drawn out sequences and other “gotcha” kind of moments. Dialogue and characters. Great blends of comic and serious, deep and light, etc moments. Very well put together from that end. Repetitive events. You know that scene in the preview where someone is grabbing on to some space ship part for dear life, and it appears that if they miss it they will be lost in space forever? Yeah, I’ve now seen that moment a few dozen times, to the point where I’d predict a Gravity Drinking Game around it. It’s just too much, and while I get it that that’s a big part of the premise, it becomes nearly comical after the first few times it occurs. Too many crises. If you’ve read the trivia around Apollo 13, you’ve probably noticed they deliberately removed some of the events that transpired in real life from the film, mostly because they didn’t think the audience would find it believable. In Gravity, I felt that the cascading series of mishaps were just too many from start to finish. I think numerous moments could’ve been reduced or removed completely and the end result would’ve been more gripping. Instead, I kept getting that feeling where my suspension of disbelief was being taxed. Too many “last possible moment” sequences. To avoid spoiling anything, just imagine a caper movie where the bomb is set to go off, and after a ton of action, the bomb is defused with less than a second to go. Now do it 3 or more (I’ve lost count) times in the same movie. It certainly builds up tension, but also increased the “okay, now they are just messing with me” effect. The trailer. 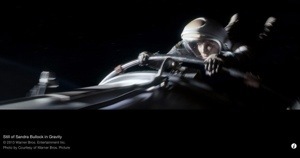 While I’d say it’s a tossup between Drive and Hancock as to “worst expectation setting for a movie, EVER,” I’d say Gravity’s trailer is on thin ice. If you’ve paid too much attention to it, it’s pretty ridden with spoilers (thankfully I had not seen it more than once before going into the movie). But if you also just saw it once or twice, you’d probably be thinking it’s a non-stop space action flick. It isn’t, and if you are unfamiliar with the director’s other works, you should definitely pay them some attention first. The movie paces really well actually, but it’s a much more drawn-out film than I think a lot of people will expect. Annoying 3D. I wish I’d seen the IMAX 3D version, maybe that would change my feelings here. As it is, I didn’t, and other than 2-3 “really cool” uses of 3D, it was pretty superfluous to the movie.